Two staff associations within the UK's police forces are at the centre of an increasingly bitter dispute. 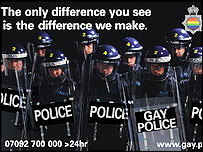 The row between the Gay Police Association and the Christian Police Association has been simmering for a while. A newspaper advertisement taken out by the GPA coincided with London's Europride event a fortnight ago. 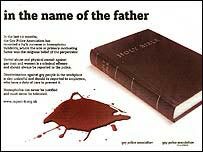 The ad featured a Bible next to a pool of blood under the heading "in the name of the father", and claimed that religion was the sole or primary motivation behind most of the homophobic incidents logged by the GPA's staff helpline. A minister, Reverend George Hargreaves, complained about the advert and said its claim was nonsense. He also called the GPA "Christianphobic", prompting a Met Police investigation into whether the advert constituted a faith crime. But far from backing down, members of the GPA say their colleagues in the Christian Police Association are themselves guilty of breaking police equal opportunities rules which outlaw discrimination on the grounds of sexuality. The GPA's national coordinator Vic Codling told BBC News they are in dispute with the CPA after a gay, Christian police officer was refused membership of the CPA unless he agreed to become celibate. "Black or female police officers wouldn't be asked to be "less black" or "less female" in order to join staff associations, so why should gay or lesbian officers?" said Mr Codling. The unnamed Metropolitan Police officer sought the help of the GPA, who referred the complaint to the Police Federation. When the GPA complained about the case of the gay officer, the CPA sent them their "position paper" on homosexuality which is based on a report by the Evangelical Alliance. It states it rejects homophobia, but doesn't regard religious criticism of gay lifestyles as discriminatory. The CPA's Executive Director Don Axcell, told BBC News that his organisation was trying to be conciliatory, but the GPA were being uncooperative. "They published a vitriolic article in Police Review magazine about faith-based homophobia. We've been trying to work through conciliation, but we keep coming up against conflict." And Mr Axcell disputes the GPA's allegation that religion is a motivator of homophobia. "They say their helpline dealt with 14 cases of faith-based homophobia last year - but not all of that was Christian. "Fourteen cases is minuscule if you consider the thousands of police officers in Britain. And what's considered to be homophobia is in the mind of the complainant." Mr Axcell denies that his members are homophobic. And he points out that although some CPA branches do some of their work on police time, the GPA he says, receives thousands of pounds of funding from the government. The case concerning the Met officer was due to be discussed on Friday, with the Police Federation's chairman Jan Berry acting as mediator, but the meeting was cancelled because of a planned rail strike. The Police Federation said it did not want to comment on the case at the moment. Mr Codling says he's not anti-Christian but he doesn't want people's faith interfering with their job, or encouraging them to discriminate. "Some homophobes look around for excuses and see the CPA's position and it gives them support. But many of them don't have a practising religious background themselves." Mr Codling thinks that some of the problem lies with senior officers either being practising Christians, or members of the CPA itself, which Mr Codling says raises questions about how willing they are to confront work-based prejudice. "The police wouldn't accommodate the discriminatory values of the BNP, so why are they accommodating the values of the CPA, simply because they're based on faith?" And referring to the police investigation of the GPA's advert, he says it wasn't badly received by all Christians. "A police chaplain told me he wasn't offended and wanted to put the ad on his notice board because the issue needed to be discussed."